Shigeo Satomura was born in 1919 in Osaka. He obtained his Ph D. from the Osaka University School of Physics in 1944 and thereafter worked at the Institute of Scientic and Industrial Research, Osaka University. Satomura was appointed assistant Professor in 1952 and was conferred the degree of Docter of Medical Sciences in 1960. He died from a sudden subararchnoid haemorrhage at the Osaka University Hospital in the same year, at the age 0f 41. After his death he was promoted to Professorship by the University. In 1955, Satomura began using microwave and ultrasound in industrial research, shortly following his initial efforts in measuring vibrations on wooden boards. Professor Kinjiro Okabe, his supervisor at that time suggested that he applied his ultrasound techniques to medical diagnosis. In collaboration with T Yoshida and Yasaharu Nimura, medical doctors (cardiac physicians) at the Osaka University Hospital, they tried to apply the techniques to the measurement of the heart and pulsations of peripheriral and eye blood vessels. In December 1955, Satomura published his first paper on the subject entitled "A new method of the mechanical vibration measurement and its application". In this paper he demonstrated that doppler signals can be retrieved from heart movements when insonated with 3 MHz ultrasonic waves. Together with Ziro Kaneko, they constructed the doppler flowmeter to measure the doppler noise from these blood vessels. These works were part of Satomura's Dr. Med. Sci. thesis which he presented in November 1959. Ziro Kaneko was Professor at the Department of Neuropychiatry, Osaka University Medical School and he proposed to Satomura to study blood flow in the human brain in cases of dementia to differentiate the Alzheimer variety and those that were of cerebral vascular origin. From July 1958, they embarked on studies of the extracranial portions of the cerebral blood supply using Satomura's doppler flowmeter. They were able to demonstrate in the same year that ultrasonic Doppler signals from arteries and veins could be found from the surface of the skin and pioneered early transcutaneous flow analysis in systole and diastole, in the normal and in the diseased blood vessels. In October 1958, Satuomura had presented a paper entitled "Study of blood flow in vessels by ultrasonics" at the meeeting of Japan Acoustics Society. This was in the Japanese language. A similar article "Study of the flow pattern in peripheral arteries by ultrasonics" was published in the Journal of the Accoustic Society of Japan in 1959. The paper was in Japanese with an English summary (as shown below). On December 4th 1959, Satomura's apparatus was shown in the Japanese daily newspaper the Mainichi News. The English summary of the first Japanese paper on a transcutaneous Ultrasonic doppler flowmeter by Satomura in 1959. In the beginning of 1960, before his death (in April) Satomura also finished two important studies and papers on an "Ultrasonic doppler Cardiograph" and the "Ultrasonic blood rheograph". In 1960, Ziro Kaneko presented the paper "Ultrasonic Blood Rheograph" (with Satomura) at the Third International Conference on Medical Electronics. Kaneko postulated that while the doppler flowmeter could not measure the quantitative blood flow volume, it could examine qualitatively the characteristic rheological changes of blood flow in various clinical conditions. In the summary of the paper, Satomura and Kaneko wrote, "Ultrasonic waves are transmitted to the blood vessels from the surface of the skin and, by demodulating and amplifying the reflected waves that are produced by the turbulent flow within the blood stream, a noise is obtained that changes its intensity in proportion to the velocity of flow of the blood. It is thus possible to determine the state of the blood flow in the arteries and veins and to judge the condition of the blood vessels ......". This was the precursor of spectral flow analysis. The first commercial aparatus was built and marketed by NEC (Nippon Electric Company) and was called a Doppler Rheograph. The Dean Franklin group at the University of Washingtom, Seattle also described a "pulsed ultrasound flowmeter" in 1959, but this was an invasive device which was attached to the blood vessel wall of an intact unanaesthetised animal. Satomura and Kaneko's method was on the other hand transcutaneous and non-invasive. The Franklin group only reported transcutaneous doppler flow detection as a non-invasive technique in the Journal of Applied Physics in 1966 and in their paper they cited that their method was in principle the same as that used by Satomura and Kaneko in 1960. Compared to the western world, throughout the history of doppler ultrasound, Japanese research has played a leading and major role in its development. Much of the ground-breaking research were presented in national engineering journals and at the annual scientific meeting of the Japan Society of Ultrasonics in Medicine (in japanese) and were thus unknown to the west until a later date. After Satomura's death the group was joined by Kanemasa Kato who was head of the division of Accoustics in the Institute. Satomura had always thought that the doppler signals were generated from turbulent flow in the blood vessels, but it was later found that such signals were also obtained from laminar flows. Kato demonstrated in 1962 that doppler signals from blood flow were actually produced by waves reflected from moving red blood cells and the frequency of the detected sound correlated with the speed of the flow and output voltage correlated with the number of particles (spectral flow analysis). By 1963, the Osaka group had developed spectral flow analysis (flow velocity waveforms) that are much in used today. 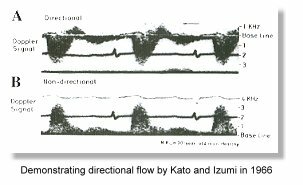 In 1966, Kato and T Izumi developed for the first time a directional flow-meter using the local oscillation method where flow directions were detected. Reverse flow in the arteries could then be documented. The directional doppler was also indepently developed by F McLeod in the United States in the same year, based on a different principle, the phase-shift methodology. Quite unknown to the western world the application of doppler flowmetry in Obstetrics and fetal assessment had started as early as 1968 in Japan, when the H Takemura and Y Ashitaka group described umbilical arterial and placental doppler waveforms at the 14th meeting of the Japan Society of Ultrasonics and Medicine. In the west, the application of doppler ultrasound in Obstetrics other then it's use as a fetal pulse detector did not catch on until 1977 when 3 separate groups of investigators made important pioneering contributions. Kaneko Z., Koniuta K. Kotani H and Satomura S (1959) Studies on peripheral circulation with ultrasonics (I) , abstract of the 65th Meeting of Kinki Psychiat. Neurol. Society (feb 21, 1959). Psychiat Neurol. Jpn 61, 2140 (in Japanese). Kaneko Z, Komuta K, Kotani H and Satomura S. (1960) Studies on ultrasonic blood-rheograph Brain and Nerve 12. 92 1-935 (in Japanese). Satomura S. (1959) Study on the diagnostic application of ultrasonics. Med J Osaka Univ. 11, 4747-4757 (in Japanese). Satomura S.. Matsubara S. and Yoshioka M (1956) A new method of mechanical vibration measurement and its application. Memoirs Inst. Scient. Indust. Res. Osaka Univ. 13, 125-133. Satomura S , Tamura A and Kido Y (1958) Study of blood flow in vessels by ultrasonics. Abstr. Meeting Acoust Soc Jpn Oct 1958, 81-82 (in Japanese). Satomura S, Nimura Y and Yoshtda T (1960) Ultrasonic doppler cardiograph, Proceedings of the 3rd International Conference on Medical Electronics. pp 249-2 53. Franklin DL, Watson NW, Van Citters RL (1964) Blood velocity telemetered from unanaesthetised animals. Nature 203:528-530. Kato K, Izumi T. (1966) A new ultrasonic flowmeter that can detect flow direction. Jap Med Ultrasonics. 5:28-30. Also read a brief summary of the history of the development of Medical Ultrasonics in Japan. *** From "Medical Diagnostic Ultrasound: A Retrospective on its 40th Anniversary", reproduced with permission from Dr. Barry Goldberg. "Introduction of the Ultrasonic Doppler Technique in Medicine: A historical perspective" by Yasuharu Nimura, National Cardiovascular Center, Osaka, which appeared in the Journal of Medical Ultrasound Vol 6 no. 1, 1988.